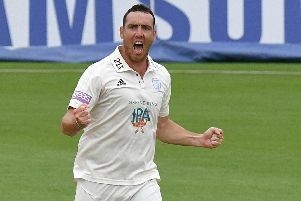 The 27-year-old has signed a new contract extension that will keep him at the Ageas Bowl until at least the end of 2022. The right-handed batsman, who has made 347 appearances in all formats for Hampshire since making his first-team debut almost a decade ago, has agreed a new deal four-year deal. Vince, who is currently playing for Australian Big Bash League side Sydney Sixers, said: ‘I’m delighted to have signed a new contract here at Hampshire and look forward to all the challenges that lie ahead. ‘We made some great progress as a group last year and I’m looking forward to playing my part in what I hope is going to be a very successful period for us in the coming years. Hampshire Director of Cricket, Giles White, said: ‘A lot has happened to James over the last couple of years and he has shown maturity in the way he has handled the ups and downs that come with the game. ‘He’s tasted international cricket and experienced leading a young Hampshire side to success in a Lord’s final. ‘James has played a huge part in the side and he has an enormous amount to offer so we are obviously delighted that he has committed to the club for the foreseeable future. ‘James is the type of player that can turn a game on its head and has the rare ability to do so in any form of the game.